Some people like to use the advice, “go big or go home”. When it comes to toilet visits, I have to say that I wholeheartedly agree and the fact that some people don’t really bothers me. However, this post isn’t about size or volume. Oh no. This post is actually about a technical advancement that is somewhat limited in its use because other technology is not suitably supporting it. People have started to go big, but then stopped. These things tend to base their marketing strategy, quite sensibly and obviously, on hygiene. 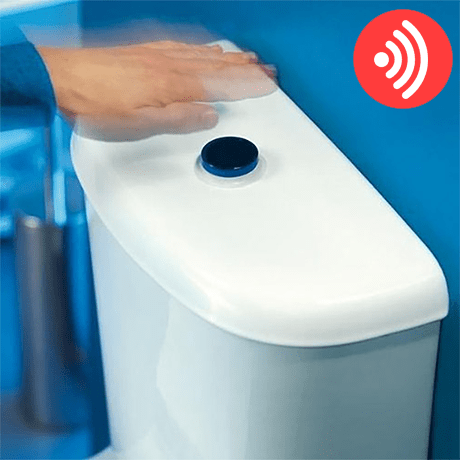 Presumably because one still needs to motion over the sensor, the hygiene benefit is not realised from the toilet being flushed (which should happen anyway) but instead by the lack of indirect contact between excrement and lever via hands. I’ve never known this technology be in the home – it seems to be a more commercial solution. So think what your next action is when leaving a stall. You unlock the door with your hand and then open it with your hand. Usually (although not always) you then have to lay your hand on a soap dispenser before putting them under an automatic tap. The only situations, then, that I can picture someone benefitting from the solution is the person for whom hygiene isn’t a problem anyway or the person who decides not to shut the door. It annoys me because it’s an over engineering solution to seemingly no benefit, but it also annoys me because no-one has yet commercialised a solution for handsfree cubicle door opening to make it useful. It’s like half a solution. Sometimes things don’t work on their own. They need another part. Go big or go home.